The scaffolding metaphor is perfect. 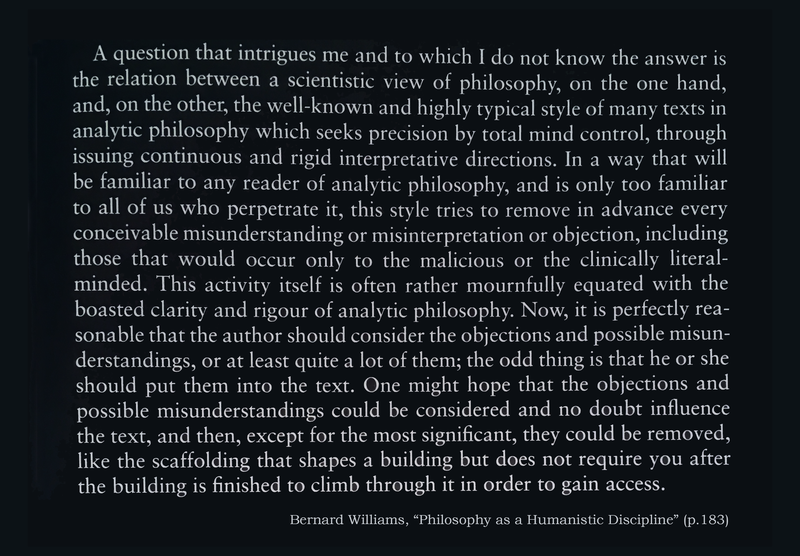 Williams provides good style advice, but perhaps some reflection is owed to why philosophers are prone to leaving in so much scaffolding. Might part of the answer be found in the academic publishing process, such as the combination of the importance of publications and the lack of trust one has in referees? Getting an article published can be crucial to one’s career, so, one might think, it’s best to do what it takes to get published. If that means sacrificing style and readability in order to address possible objections that otherwise would have led some possible idiosyncratic referee to suggest a rejection, so be it. And perhaps these writing habits, once developed, stick around long after they’re needed. Understandable, but still regrettable. What other factors, besides publishing pressure, contribute to a more complete explanation of this style and its persistence? And how should authors decide what to leave in and what to remove? Your thoughts welcome. † Okay, possibly just me.